*This post contains affiliate links, which means that if you click on one of the product links, I may be compensated. All opinions are my own, however. If you're anything like me, one of the best things in the world is getting cards and letters via snail-mail. This is especially true now that our lives are becoming more and more electronic. Cards used to be boring and emails were exciting, and now it's the other way around entirely. Christmas time often yields a card or two, making an already-exciting holiday even more exciting. And now that Taylor and I are married (it's our second Christmas), I really want to send out cute, personalized Christmas cards. Any other newly-married couples with me on that? As Black Friday approaches, I know there are going to be all sorts of ads for presents, gift wrap, recipe books, and Christmas cards. There are an umpti-bazillion (sure...that's a number) places you could turn to buy those cute cards, but one place I am loving is Minted. 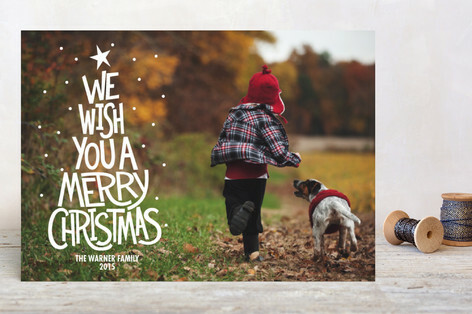 Minted has all sorts of holiday cards, post cards, stationary and gifts. They offer personalized cards and post cards with hundreds of styles and colors to chose from. I love this post card for it's simplicity. The color at the bottom gives it a Christmas feel without adding too much, you can add your own little note, and the script adds an elegant touch. I absolutely adore the Christmas tree text. It's fun, a little quirky, but still not overdone. How cute would that be to send to your friends and family? 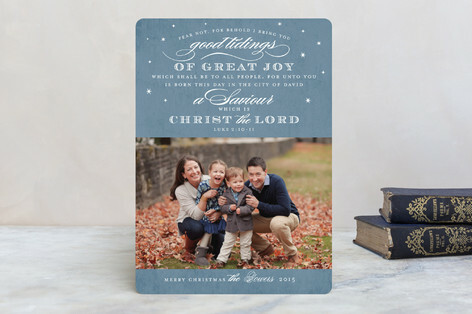 This Christmas card comes in several different colors and features Luke 2 as it's text. You can also add your personalized text at the bottom. If you are looking for a more blatantly Christian card, this one is a great choice. 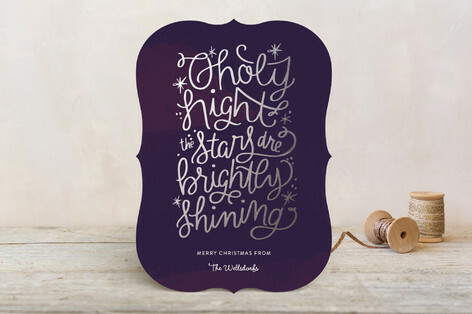 One of my favorite Christmas songs is "O Holy Night", and my favorite color is purple, so I am loving this card. 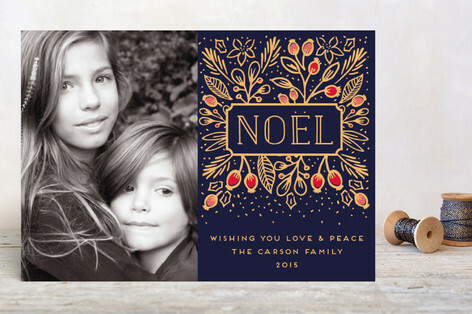 You can personalize the "Merry Christmas From:" at the bottom, and you also can personalize the back of the card. This comes in a few more colors if you don't love purple as much as I do. Isn't this gorgeous?! I love the color combo and I love the word "Noel", which means "news" in French. I love that Christmas is all about bringing the news of hope to the world. With this card you can chose from a few other colors (black, green, and red). Though these were my top 5 cards at Minted, there are so many different options. I highly recommend checking them out. They have post cards, mini-post cards, foil-pressed cards, ornament cards, and more. Use this link to check it all out! I am getting really excited about sending out cards, putting up the Christmas tree with my hubby, baking cookies, and listening to LOTS of Christmas music. What traditions do you have? Are you sending out cards this year? I love "Oh Holy Night" too. I also love receiving cards, it is one of my fave holiday moments to hold onto! Have you seen the episode of Friends about Ross and his girlfriend and the Christmas card? Too funny! This reminded me to order our Christmas cards! 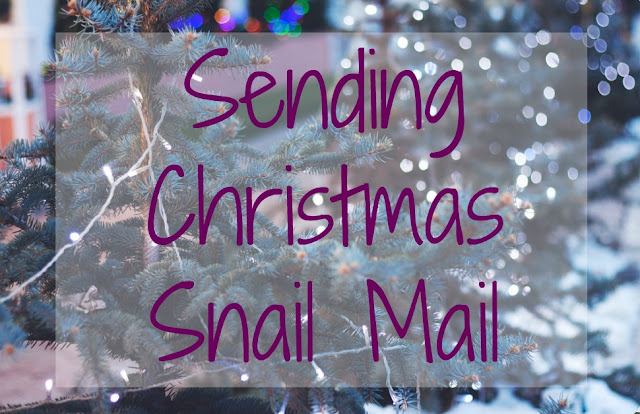 I love getting and sending snail mail so much that I made it one of my goals to do more of this year! I did an okay job but can definitely do better by actually sending out Christmas cards! As far as traditions, my hubby, our son and myself go on Black Friday and get out Christmas tree and decorate it then we do the outside of the house, too. On Dec. 23 we go look at Christmas lights as a family, because that's what we did 2 years ago when my hubby proposed. We spend Christmas Eve with his parents and Christmas Day with my side of the family. This is our 3rd Christmas together but our first being married so we're creating new traditions of our own, too. That sounds like so much fun! I hope my hubby and I can go see lights too! I love snail mail! I hope to take my daughter's picture this week for our Christmas card, so I will definitely keep Minted in mind. Their cards are so beautiful. Love the variety of card options! While sending things digitally is so much easier, I do love snail mail! I love these! We haven't decided if we'll send out Christmas cards this year, but I probably will end up doing something! I love sending out Christmas cards in the mail! It's such a nice surprise to receive cards, and so I want my family and friends to experience that, too. The first two are my favorite. I love sending and receiving Christmas cards and photo cards are the best. I gotta order mine now! I'm definitely going to. Got to check Minted today. Super super cute! Love the Christmas tree text! These are so cute! 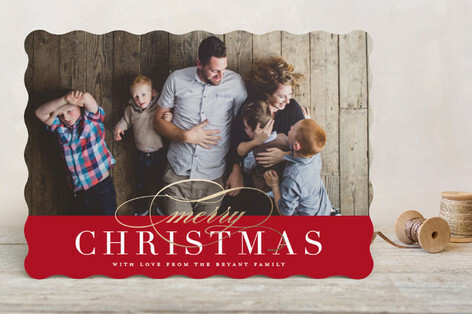 I love picture cards for Christmas, plus it gives you a great reason to take a family photo! Aww I tried clicking the link and it said error. Could be because I'm on my kindle maybe but it definitely didn't work. But on a brighter note, I adore Christmas cards and I'm trying to figure out what to do this year before time is up! I fixed it! Thank you for letting me know! I haven't sent out cards in years, but I would really like to this year. I love the options that don't have a picture. Very nice. Yeah, I really like them! I love Minted and how customizable their cards are! Which one did you end up going with? I didn't end up going with any of those actually, but they are all gorgeous! I love Minted, especially the cards that they came out with this year!! Love those Christmas cards! We are ordering ours today! Thank you! I did not even know about minted. This year I want to start sending out Christmas Cards. I have never sent them out, but financially I have the means to do it. Eek how exciting. Wow, so beautiful! I love them all! We don't send cards. I thought about doing it this year but got too lazy about planning photos and such, and I think it's too late now, since we live in Europe and most everyone who'd want a card from us is in the States. There's always next year! These are really beautiful! We are ordering from Shutterfly this year because I have a gift card. I love photo cards! These cards are beautiful. Nothing better than sending or receiving personalised things. I love sending snail mail as well. It's so fun and thoughtful. I love the cards you chose!! Beautiful! They are so cute! I love the 2nd card... it's funny and beautiful.